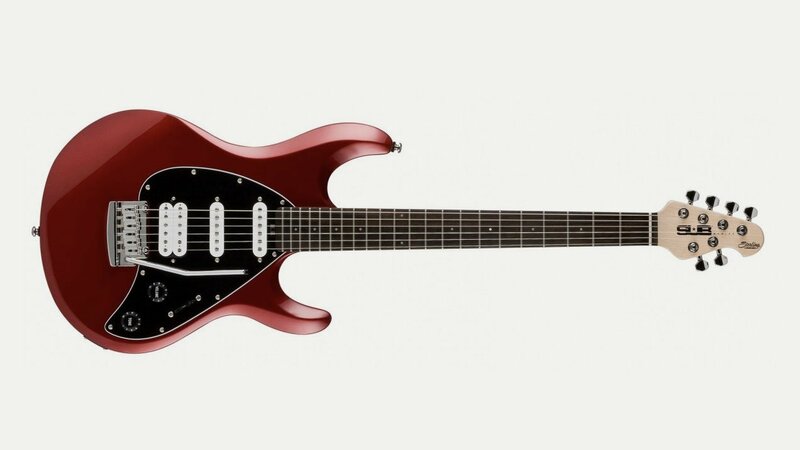 These Sterling guitars are great value and the Silo3, a versatile workhorse, is easy to play, comfortable and sounds like a higher end guitar. The solid hardwood body is attached to the solid maple neck via a Music Man designed 5 bolt neck joint. The neck heel is contoured and rounded over for easy & comfortable access to the higher frets. The double cutaway, contoured, hardwood body is fully sculpted and shaped for comfort. All sharp edges have been eliminated and you have just the bare essentials you need for a comfortable, solid body shape that never feels awkward. The asymmetrical cut maple neck is slimmer on the treble side and thicker on the bass side, for effortless movement as you move around the neck. Thick enough for great tone, thin enough for easy playability. The medium sized fret wire is easy to fret and offers great intonation up & down the neck. The pick guard is loaded with 2 high output single coils and 1 overwound humbucker which have clear bell like tone, but can also shred and emote all the nuances of your playing. A 5 way selector switch is wired to a single volume & tone control. The vintage style tremolo bridge has a comfortable area to rest your palm on. The solid saddles offer adjustments for height and intonation. The guitar gives a great range of sounds for the money at RRP£239. Looks good in Vintage Sunburst too!